The NIGHTSEA Filter Visor enables you to experience the true impact of fluorescence. Without it the intense blue light produced by the NIGHTSEA lights would mask many fluorescence effects – you would see brightly fluorescing subjects but miss many other small, subtle, wonderful things there are to see. The filter visor color is carefully matched to the flashlights so that it removes the reflected blue and transmits the fluorescence with good efficiency. You wear the filter visor outside your mask, with an elastic strap that goes around your head. The NIGHTSEA Mask Strap Wrapper captures your filter visor to your mask strap so that you can’t lose the filter during a dive, and it also serves to protect the filter visor when you are not using it. It opens completely along one edge so that you easily attach or remove the Filter Visor strap without disassembling your mask strap. With your Filter Visor secured to your mask strap you won’t lose the visor during a dive, and you can push the visor out of the way on top of your head when you don’t want to look through it. 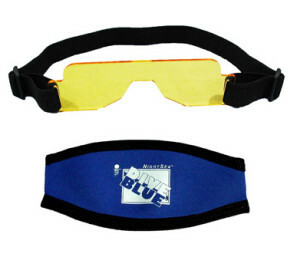 Filter Visors and Mask Strap Wrappers are included in the NIGHTSEA dive packages and can also be purchased separately.